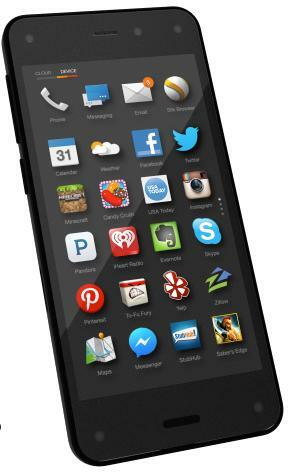 Amazon Fire Phone can’t compete with big boys at least for now. For Amazon it is not the next Big thing but a step forward. The newly release Fire Phone a first Smartphone from Amazon is different but not as great as Amazon thought it would be. It took Amazon nearly 4 years to build their first phone. And maybe the problem with the phone is that its 4 years late. The Fire Phone is different than your average phone those days, it definitely has some really cool features but as a Smartphone it can’t compete with giants like Apple and Samsung. We dint have a Fire Phone to play with so we cant give you a good review, but we can tell you few cool thing about the phone and few not so cool. Amazons first Smartphone at a first glance looks like mini Fire tablet, and if you look closely thats what it is with some extras. To be so late in the game you would figure that Amazon would take all the mistakes from the other phone manufacturers and make sure that they don’t do the same. Firefly is definitely cool and my favorite feature, it is sort of a like QR scanner, Shazam and Laser Scanner combined on steroids. Take a object in front of the camera and Firefly scans it and find it. Amazon is one of the biggest market places for books, music and pretty much anything that you can buy. Amazon took that and made Firefly their own Amazon search engine. The main features in Fire Phone are the 3D effect Dynamic Perspective which is cool. Dynamic Perspective is A custom-designed sensor system that responds to how you hold, view, and move your phone. 4 Sensing cameras follow your head movement to hive you the effect, but at the same time probably dr5ain battery very well and even give you motion sickness like IPhone did. Mayday is not new, it has been around on Fire Tablet but now it is available on your phone. I got to give Amazon credit when it customer service , Amazon is great. Free, live, on-device video support 24×7. Fire Phone price is similar to Galaxy S5 and Iphone 5S, In my opinion that is too much, after all the phone is good but not that great. The phone its self is little bulky and has glass in the front and the back, rubber on the side. If one thing Amazon should know is that glass breaks and does not look good. Apple IPhone back is also glass and we all know what happened. IPhone on the other hand is smaller that Fire and is protective case friendly where Fire is already bulky and adding a protective case will make it even bulkier. Free unlimited cloud storage – Amazon is not the first one to offer free unlimited clud storage, but as we know that is only temporary. So far what we noticed is that the battery and the sim card are pre-installed and are not user accessible. We also noticed that the Fire Phone OS is Android based and has Android apps and tools but Google might have been left out. We think that the phone has few really cool features that will turn few heads but it will not win over Galaxy and IPhone fans. Battery Battery size: 2400mAh. Talk time: up to 22 hours; standby time: up to 285 hours. Video playback: up to 11 hours; audio playback: up to 65 hours.